Kaip užtikrinti saugą, slaugant senyvo amžiaus žmones namuose. 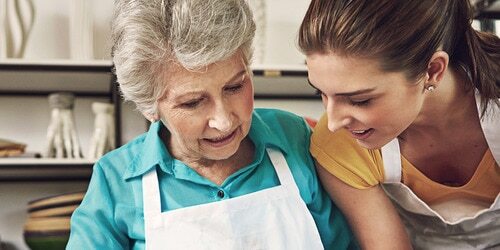 There are many things you can do to help keep your loved one safe and comfortable at home. They’re things that might not have mattered in the past, when he or she was younger. But if the person you care for is now unsteady on their feet, it’s important to address any risks. Then you’ll have peace of mind, knowing they can move about safely and that you’re providing the best possible care. Dementia, confusion or other mental limitations. It’s important to check your loved one’s living environment and spot anything that could pose dangers to them. Then you’ll be able to make the changes you need to prevent accidents. 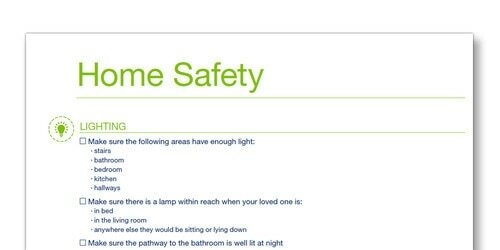 You can read more general information on home safety here, or pick up some practical suggestions to help you boost safety below. Atsisiųskite saugios namų aplinkos sąrašą PDF formatu. Make sure all areas in the home are properly lit. Install additional lights on stairs, in corridors, and where a passageway turns. Put a lamp next to your loved one‘s bed. Install a nightlight to make getting to the bathroom easier in the dark. Move items to make it easier to reach them. Arrange furniture so that there’s plenty of space to walk comfortably. o improve traction on stairs. Make sure all furniture is stable, and that any unstable pieces are fixed or replaced. Install protectors on sharp corners of glass tables or countertops. Never underestimate the risk of fire at home – install smoke and fire detectors (and check batteries inside regularly). Consider installing cookers and ovens that automatically turn themselves off. When replacing other appliances, choose those with an automatic switch-off function. Check how your kitchen is arranged. For convenience and safety, keep dishes, glassware and other frequently used items in drawers or cupboards that are easy to reach. Consider using a medical alert device – you can purchase a wearable alarm for your loved one to use in the event of an emergency. He or she simply has to press the button on the device and the appropriate emergency service will be alerted. Add supporting grab-bars everywhere your loved one needs them, for example in the shower or bath, or next to the toilet. Place anti-slip mats around the shower and sink. Install a special shower chair if you think it will help. Consider installing an elevated toilet seat – it helps seniors to get up and down easily. Create a simple, easy-to-read list of your/your loved one’s important numbers, and keep it within easy reach. Include numbers of other relatives, neighbours, and emergency services. There’s a lot to consider when making your home safer for an elderly person. Why not print out the above list and stick it on your refrigerator? Then you can check that you’ve got everything covered. Why not print out the above list and stick it on your refrigerator?